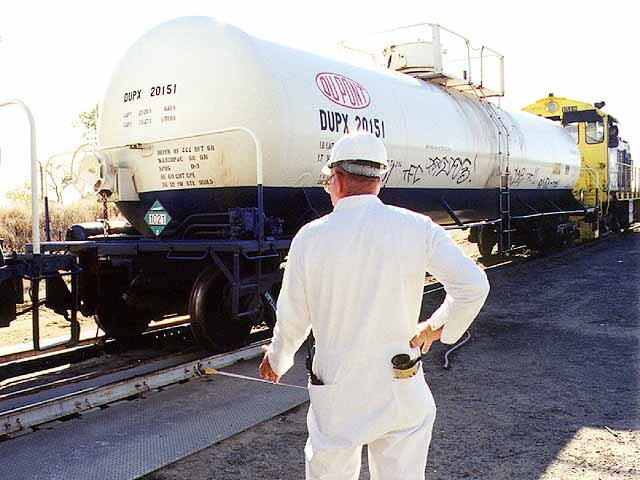 After more than four decades of operating in Oakley, the DuPont chemical plant announced that it would shut its doors forever on November 30, 1998. In addition to the loss of at least 80 jobs, the closure also meant that the plant's Alco S-4 switcher would cease operations. Because we have lived near the plant since 1991, the switcher had become a familiar presence. Every weekday morning you could see it working in the yard between Milepost 1147.2 and MP 1148.2. It was hard to believe we soon wouldn't be waking up to the distant sound of its horn and screeching wheels anymore. Determined not to let the switcher fade from the scene without a few photos, Glenn decided he had to try and document the plant's railroad operations. 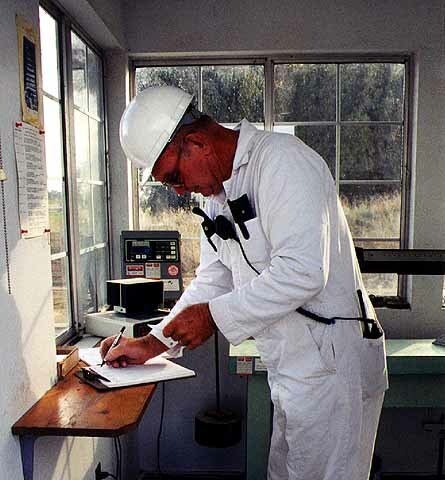 Through a week of persistent phone calls he obtained permission to go inside the plant and ride along with the crew of DuPont 1518 on the morning of Nov. 2, 1998. Seen here in one of our screensaver "postcards," DuPont 1518 poses for a roster shot. This 1,000 horsepower Alco S-4 locomotive was built in 1951 for the Santa Fe railway and most likely worked in Richmond for a time before it was sold to DuPont in 1976. 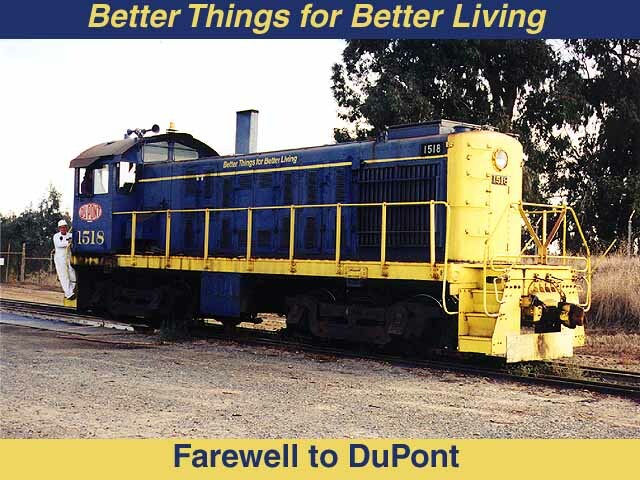 The locomotive retained its Santa Fe colors and original road number, although the railroad's name was replaced with the slogan "Better Things for Better Living" and the DuPont logo was added to the sides of the cab. (Special thanks to Evan Werkema for providing the historical data.) Photo by Glenn Gehlke. Preparing for the start of their work day, 1518's crew of Elmer Bell and Diana Hernandez converse while the S-4 idles nearby. 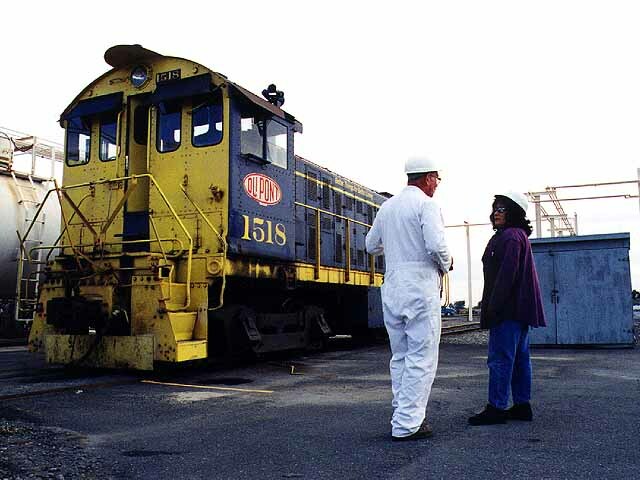 Bell has worked for DuPont for 25 years, while Hernandez is a contract worker with Power Fluid and Metals of Redwood City, Calif. She has been driving the locomotive with Bell for the past year. They will occasionally trade roles, with Bell in the engineer's seat and Hernandez riding with the cars. Photo by Glenn Gehlke. 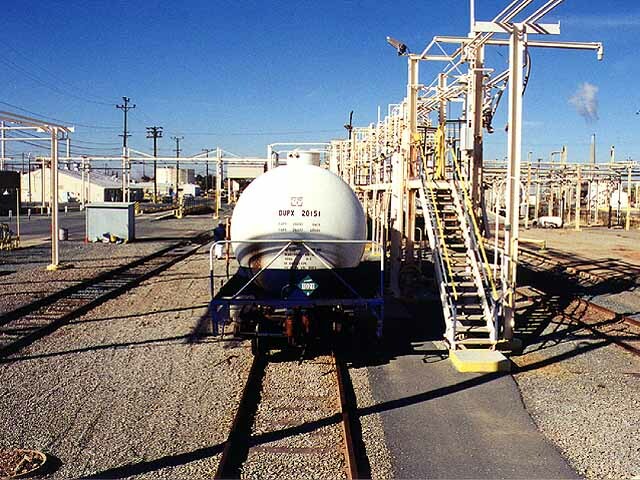 Looking west from the cab, the 1518 backs down on a tank car as it sits in the loading rack after taking on several thousand gallons of Freon for a customer. This car and another one behind it have been inspected and now must be hauled out to the main yard for pickup by the BNSF road switcher. First they will be weighed. The steam cloud visible in the upper right corner of this photo is being produced by the PG&E power plant in nearby Antioch. Photo by Glenn Gehlke. At the scale, Bell motions to Hernandez to ease the cars ahead slightly so that the second car is properly positioned for weighing. The lead car is carrying approximately 130,000 pounds of Freon. The latent motion of the liquid within the car causes it to rock for a few seconds after the train stops, so the crew must wait until the movement subsides in order to get an accurate measurement. Photo by Glenn Gehlke. This is the inside of the scale house. Bell records the weight of each car with an electronic scale (visible to the left) and then records the number by hand on a clipboard. Photo by Glenn Gehlke. With Bell hanging off the footplate, 1518 rounds the east leg of the plant's wye as it heads for the gate to the yard. To my knowledge, this is the only wye in use for miles along the Stockton Subdivision. On rare occasions it is used by BNSF's road switchers. Photo by Glenn Gehlke. Here is the view from the cab looking out at the east yard. It is empty now, having been consolidated with the west yard, but at one time you could count on seeing upwards of a dozen cars on these holding tracks. The plant has since lost most of its business producing Freon, paint pigments and lead additives for gasoline, most of it through environmental regulations and a changing economy. Photo by Glenn Gehlke. 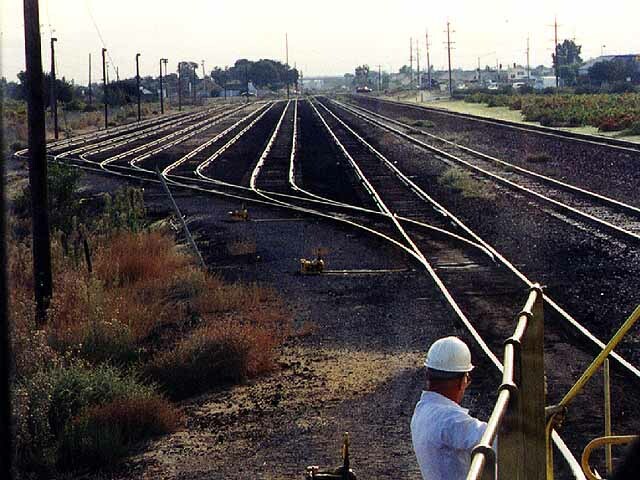 With Mount Diablo visible in the distance, Hernandez releases her consist into the west yard where it will sit on the hold track with about a dozen other cars. Photo by Glenn Gehlke. 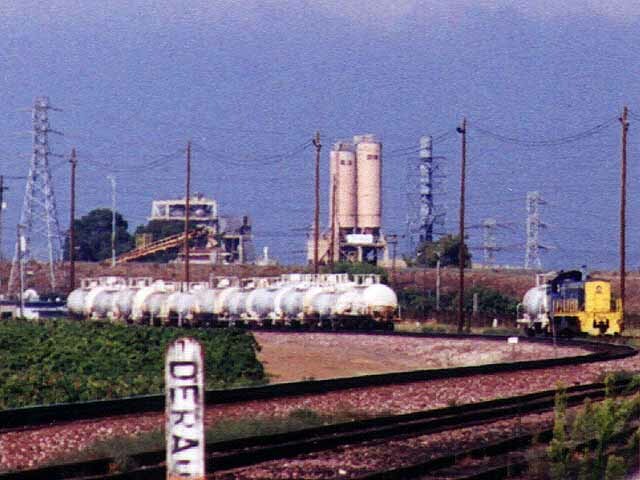 The quality of this image is much poorer than it appears in the thumbnail, but I have included it because it shows just how busy the yard used to be. 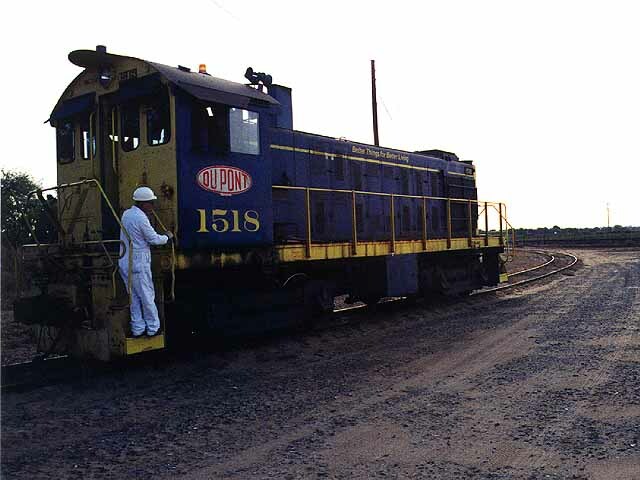 This shot was taken one morning in late September 1998 as the 1518 drags a car back toward the plant. I shot this using a 200 mm zoom from over our back fence and blew the print up to about 1,600 percent of its original size. The plant visible in the distance is a concrete batching facility. Photo by Glenn Gehlke. Another view of the west yard, this time looking northeast from the Shell gas station at the corner of Bridgehead Road and Highway 4. There was an ugly ole telephone pole in my way when I took this photo in October 1998, but through the magic of Photoshop I have made it go away. Can you guess where it was? Photo by Glenn Gehlke. This page was last updated Tuesday, November 10, 1998 at 03:31 hrs.